I'm back on familiar birding grounds and making up for lost time. On Friday, I stopped in at the Vantreight bulb fields and had my first self-found Yellow-headed Blackbird (Xanthocephalus xanthocephalus) in a sizable blackbird flock and yesterday (Saturday) I met up with Jeremy K. and did the Sooke-Metchosin-Esquimalt circuit to see if we could turn up any interesting fall birds. Our day started with a frigid stroll to the tip of Whiffin Spit and back. This walk always seems to be the football equivalent of a Hail Mary pass - nine times out of ten it doesn't pan out, but the rewards are huge for the one time you make the pass. Today was not the big payoff we had hoped. Bird activity was plentiful with flocks of Zonotrichia sparrows, but we just couldn't seem to dig out anything unusual. We did manage to start a running theme for the day here when we saw a Sharp-shinned Hawk (Accipiter striatus) cruise over, followed by a few Bald Eagles (Haliaeetus leucocephalus), and a Merlin (Falco columbarius) zipped through in pursuit of a morning meal. Every stop hereafter we managed to see a raptor of some sort. A stop in at the Goodrich Peninsula wasn't quite as brisk as Whiffin, but the level of success was similar. My personal highlights for this stop were a lone Bonaparte's Gull (Chroicocephalus philadelphia) flying over the marina and a flock of Black Turnstones (Arenaria melanocephala) and Surfbirds (Aphriza virgata) on the floating logs by the docks. We continued on to Metchosin via Lindholm Rd. and stopped to check out the small farm pond near the Galloping Goose crossing. The pond was quiet but we located a huge, uncooperative blackbird flock. We only managed short, partial views of the flock and consequently came up empty. The best stop of the day was Swanwick Rd. We started with a nice flock of geese on the main field, which contained 26 Greater White-fronted Geese (Anser albifrons) and 30 Cackling Geese (Branta hutchinsii) in with the usual Canada Geese (B. canadensis). Three species of goose in one flock is always a nice sight! 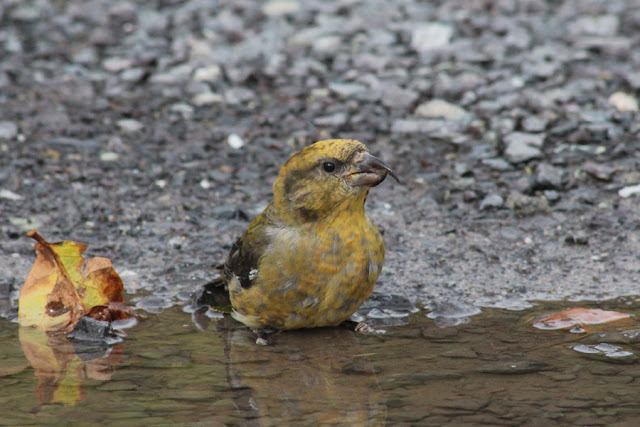 My personal highlight for the day came next as three Red Crossbills (Loxia curvirostra) descended from the top of a conifer to a couple of puddles right in front of us. I believe it was a family group as there was a single juvenile bird with an adult male and female. 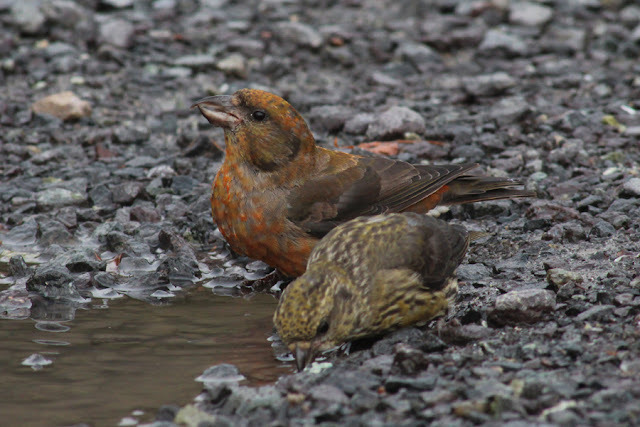 The male Red Crossbill is the reddish bird with dark wings, while the streaky, olive-infused is a juvenile. Here's a better look at the streaky appearance of the juvenile Red Crossbill. 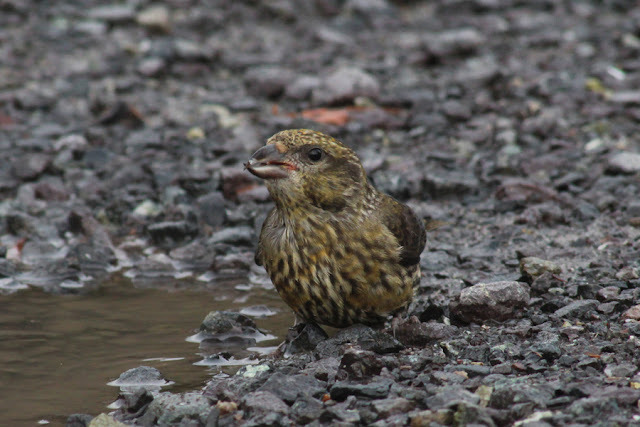 This is the female Red Crossbill and she is really showing off her namesake crossed bill! Swanwick Rd. was also our best raptor location of the day with two Red-tailed Hawks (Buteo jamaicensis), a Sharp-shinned Hawk, a Cooper's Hawk (Accipiter cooperi), a Peregrine Falcon (F. peregrinus), and seven Turky Vultures (Cathartes aura). 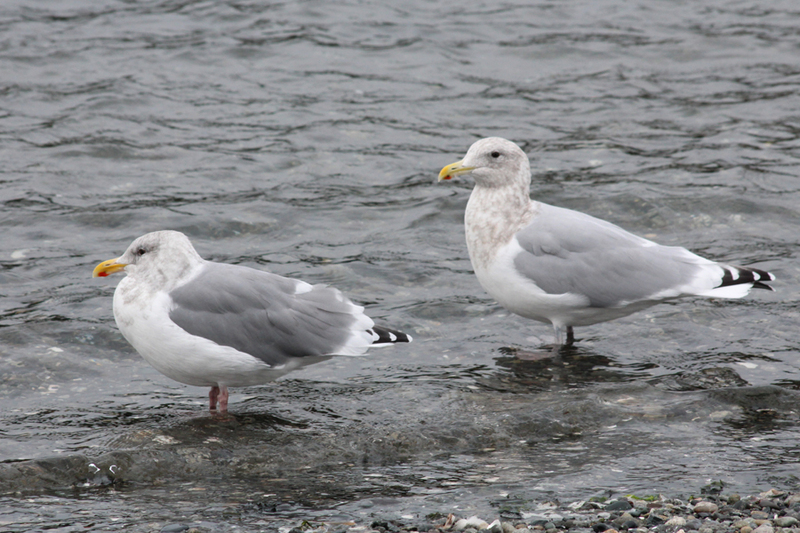 After a rather fruitless stop in at Albert Head Lagoon, we finished our day off at Esquimalt Lagoon. The high tide limited the amount of birds along the shore and the close flocks of ducks and gulls all seemed to be at the north end of the lagoon. We were starting to study a male Eurasian x American Wigeon (Anas penelope x A. americana) when a Bald Eagle put all the birds. I managed one distant shot that shows some of the key characteristics, including mottled grey and pinky-brown flanks and oddly-coloured head pattern. 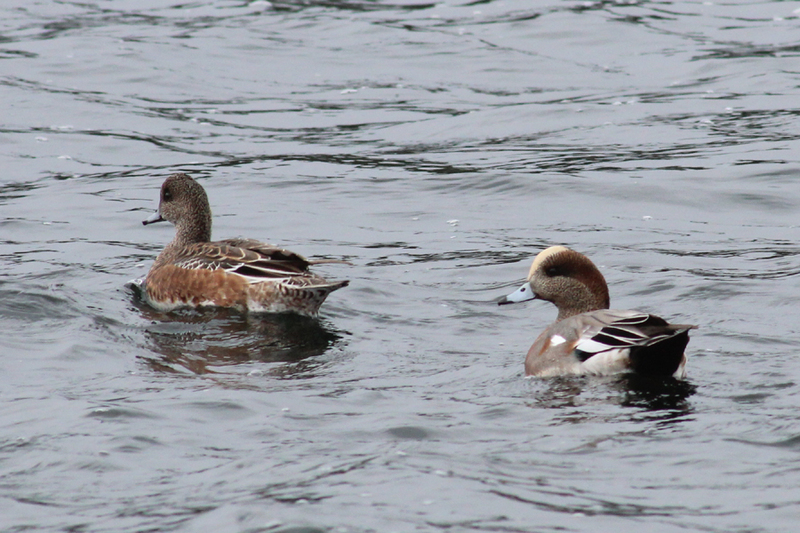 Note the male's (right) largely grey flanks which is a feature of a Eurasian Wigeon, whereas the head pattern is closer to that of an American Wigeon. This bird looks much less Eurasian-like than most reported hybrids. After the dust settled from the eagle stir-up, I noticed an adult Thayer's Gull (Larus thayeri) had landed on the shore. 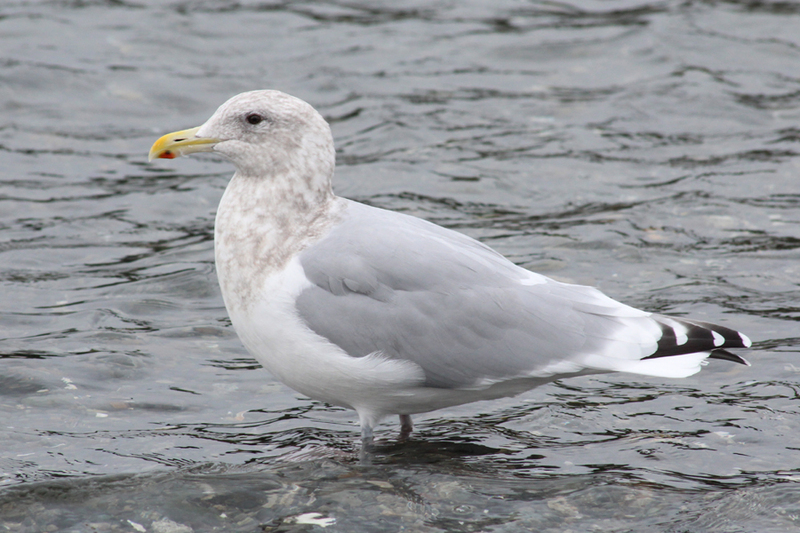 Shortly after, I found a nice American Herring x Glaucous-winged Gull hybrid (L. smithsonianus x L. glaucescens). After commenting on its identification to Jeremy K., a classic adult Western x Glaucous-winged Gull (L. occidentalis x L. glaucescens) joined the other bird. I couldn't pass up the opportunity to photograph the two side by side! 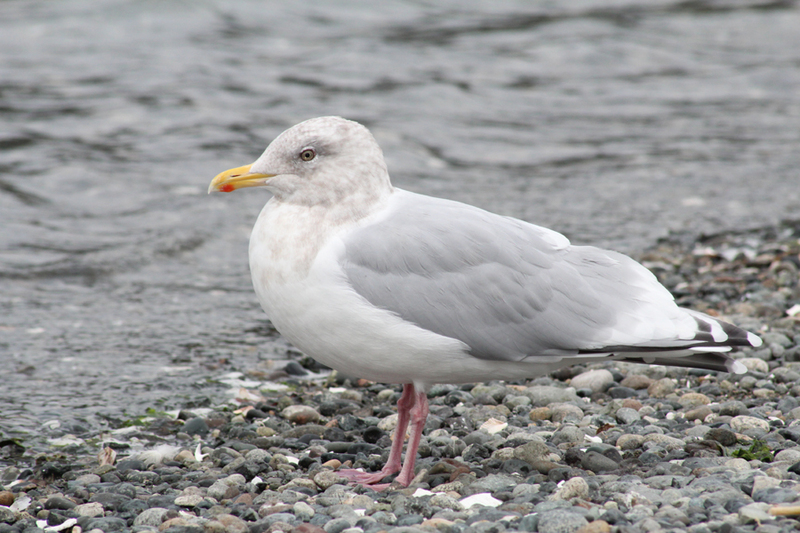 The dove-headed look is a good way to distinguish Thayer's Gulls from the more block-headed American Herring Gulls. With experience, this species is not too hard to identify (with exceptions of course) but it is hard to tell you exactly why it is a Thayer's and not one of superficially similar species. The left bird is a typical Western x Glaucous-winged Gull based on the mottled head and not overly dark mantle, while the right bird appears to be an American Herring x Glaucous-winged Gull due to the slight fading to the primaries and dark eyes. Here is a closer view of the American Herring x Glaucous-winged Gull hybrid, which shows the slight fading in the primaries mentioned above. The structure of this bird is more representative of its American Herring side as it is more slender than you'd expect for a Glaucous-winged. That's all I have from this weekend's outings. I hope to get out during the week, but whether I'll have anything worthy of posting is another story altogether! Did you get any more shots of the Thayer's Gull? Interesting looking primaries. I have a few more photos that are the exact same pose as this one. I noted the primaries already and sent it off to an East Coast birder for their impressions of the bird. Basically this bird seemingly has enough Thayer's features going for it that it might stand out, but it would be conservatively left as probably a funky Kumlien's. Interesting that we have these birds that have a certain label slapped on them depending on where they are found. This one has hints of Kumlien's but is still quite Thayer's-like and so I just conservatively left it as a Thayer's. I don't think it's overly unusual for Thayer's to show this much fading in the primaries, but who knows.